A good PMO is the glue that holds together stakeholders, the business and implementation partners on an SAP Project or Programme. Resulting offers PMO as a Service, establishing governance that will keep everyone on track to deliver, providing the business with confidence and clarity needed to run challenging SAP projects through adaptable and consistent control, holding the project team accountable to deliver. Implement core PMO functions and services for the programme including governance forums, PMO tool-kit and deliverables management. Facilitate all governance forums (e.g. project board or stage gate) including preparation of materials with appropriate stakeholders, distribution of materials, chairing of meetings, production & distribution of minutes. Assurance and distribution of Project or Programme status reports. Accountable for planning standards, ensuring the maintenance of appropriately detailed and validated plans across the Programme. Responsibility for production and management of the consolidated plan including key dependencies and defined critical path. RAAIDD management (Risk, Assumption, Action, Issue, Dependency and Decision). Tracking and management of Programme KPIs related to budgets, and resource utilisation. Manage resource demand and control processes, including forecasts, availability tracking, on and off boarding, and internal communications. Implement and monitor mechanisms for knowledge transfer and experience sharing within the team and the business. Promote a culture of continuous improvement of the PMO functions and services to enable and enhance the capability of the project workforce to achieve the project’s objectives. We're looking for PMO leaders who have experience of technology implementation - in both packaged ERP and developed applications. You're likely to have cut your teeth in a large consulting firm or corporation where you've been in the thick of Programme delivery or Project Portfolio Management. Have a desire and energy to work at pace, deliver quality, collaborate effectively, and have a mindset and personality to resolve and drive through solutions to problems. Have the ability to encourage and influence others to seek and create innovative approaches to addressing problems and opportunities. Be quality and improvement focussed, with good attention to detail, whilst maintaining a good dose of pragmatism. Be able to manage budgets and plan effectively. Have excellent communication and stakeholder management skills, with the ability to engage at all levels. Have deep experience in PMO on transformational change programmes. Have a PRINCE2 (or similar) certification and previous experience working as a PMO Lead on large global projects. Be proficient in managing complex project plans. Have previous experience operating with third party supplier/vendors. Have advanced skills in Microsoft Project, Excel, SharePoint and PowerPoint. You must be able to work in the UK and Europe without the need for a Visa or sponsorship. Resulting is an equal opportunity employer. Resulting is committed to providing an inclusive work environment that encourages and welcomes diversity with a zero tolerance policy of harassment and discrimination. We're growing fast and need people who want to be part of our growth journey, meaning that you'll get the benefits of working with an experienced team in an agile, energetic, start-up style environment. If you're doing too much travelling in your current role, this is your opportunity to achieve a better balance than working away on a long-term basis. You'll also be assigned to an experienced Board Member as a mentor - who will provide the kind of coaching and support that will push your career on to another level. We're particularly interested in people who've been around SAP, Data Warehousing and Marketing. We're also interested in people who have worked on large business and IT change programmes where there has been a focus on a new operating model and change management. Send a CV and covering letter for an immediate interview. Learn more about business-side SAP consultancy services. 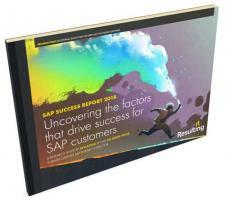 Benefit from deep SAP experience and improve your SAP maturity.